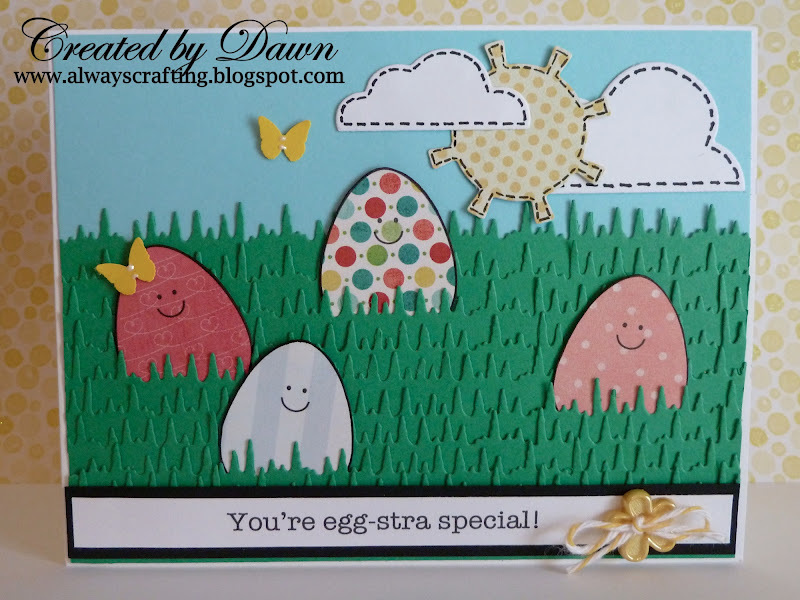 Always Crafting: You're egg-stra special! 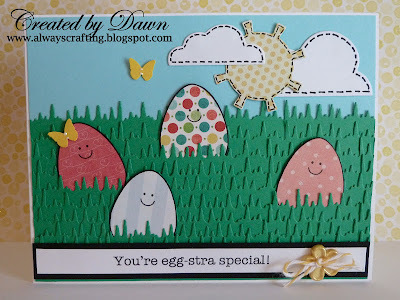 I just love these egg images from Whimsie Doodles! Some have faces, arms, legs, and etc. Using these fun images, I created this fun card. You can get these fun images from Whimsie Doodles here. Yes, your card is super fun! Thanks for joining us in Sassy Cheryl'a challenge! omg! this is to cute! Loving this cute easter scene you have created. Oh, how adorable. Super fun and cute. Love the spring colors. Thanks for playing along in the SPRING challenge this week at Sassy Cheryl's! What a cute little scene you created!! Thanks for playing along in the Whimsie Doodles challenge again! You cut ALL those grass borders? Wow! :) Thanks for joining us at Shopping Our Stash! So fun! What a cute way to use all the eggs :>) Thanks for joining in the Spring fun at Whimsie Doodles!!! WOWZA!!! Love this! Thanks for joining us at the Ribbon Carousel Challenge. Love the eggs tucked into the grass! Thank you for joining us this week at Shopping Our Stash! Thank you for joining Deep Ocean Challenges. Adorable!! Reminds me of Easter Egg hunts. Thanks for playing along with us this month at Whimsie Doodles. This is so clever! Love all the little grass. So glad you could play along with us over at Whimsie Doodles! Thanks so much for playing along with our team this month - such amazing creations you whipped up!